Scenically located at the shore of lake ”Östersjön” in Dalsland, in Färgelanda municipality. Our farm is located at the end of the road. 2 km private road through our own forest (275ha) for us it´s a paradise with absolute peace and quiet. Just the sound of creek ”Sågbäckens” ripple and chirping of birds and the occasional ”barking” from the roe dear break the silence. 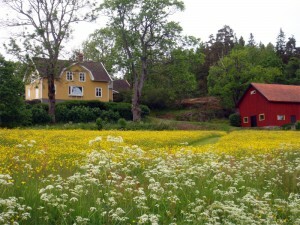 Sannerhult is 6 km from the major highway (route 172), and the nearest farm is located 4 km away. Here at Sannerhult, one can make lovely forest walks, pick berries and mushrooms when the time comes. Fish, or just sit and enjoy the tranquility of the lake, during the long, light summer evenings. Our little ”village” consists of three dwelling houses, stables, outbuildings, woodshed and sauna house. Garden furniture and barbecue for all houses. Rowing and canoeing are at your disposal. Well-behaved dogs are also welcome. However, there is no smoking in all buildings. It is 8 km to Färgelanda. There you can find two large food halls, wine/liquor store, post office, bank, pharmacy, tourist information, library, and more. Färgelanda/Ellenö golf course is about 8 km from Sannerhult. The Sea and Uddevalla is 30 km away and to Gothenburg 11 km. Many fine seaside towns to visit, such as Marstrand, Mållösund, Lysekil, Tjörn Orust to name a few. Läcko Castle on Lake Vänern is also a popular destination. Electricity cost in low season. We are closed from october until mid april.